Two Singaporeans were involved in separate car accidents abroad in the past weekend. One died, while the other was fortunate to escape with a broken shoulder. In the first incident, Mr Joshua Tan, 36, died after his car crashed into a tree in Chiang Mai, Thailand on Sunday morning. A female passenger is believed to have been injured in the accident. Following the accident on the same day, a friend of the person who had rented a car to Mr Tan, posted on Facebook about the crash, looking to get in touch with Mr Tan's family. The post included a photograph of Mr Tan's international driving permit and was widely shared. The New Paper spoke to Mr Tan's former property agent, Ms Elaine Tay, who had rented a condo unit for Mr Tannear Guillemard Road. She said he had been renting the unit for two years and lived alone, ending his stay in November when he made the decision to move to Thailand. Ms Tay told TNP yesterday: "He informed me that he did not want to rent the unit anymore because he wanted to do business in Thailand." A spokesman for the Ministry of Foreign Affairs (MFA) said: "MFA is aware of the unfortunate road accident in Chiang Mai and extends our deepest condolences to the bereaved family. "The Singapore Embassy in Bangkok is in contact with the family to render consular assistance." In the second accident, which happened on Saturday at about 9am, Mr Arthur Ong sustained injuries after his car plunged into a 15-metre deep ravine in Terengganu, Malaysia. 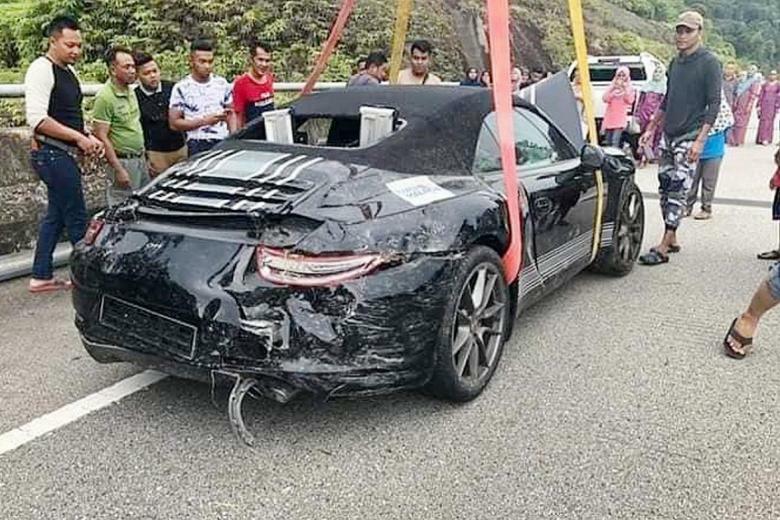 According to Malaysian newspaper The New Straits Times, the 45-year-old was driving a black Porsche along Jalan Aring-Kenyir from Dungun towards Gua Musang,about 260 km away. Even though the weather was reportedly clear, Mr Ong lost control of his car, which skidded to the side of the road and plunged off the cliff. The Singaporean broke his left shoulder and suffered injuries to his mouth, and several broken teeth. He was taken to the Kuala Terengganu Specialist Hospital for treatment. According to Chinese-language newspaper Shin Min Daily News, Mr Ong, who is the owner of Teck Wei Credit, was travelling in a convoy with other Porsche drivers. Mr Ong, who is also the second vice-president of the Singapore Vehicle Traders Association, told Shin Min that he has already returned to Singapore and is undergoing further checks at local hospitals. The Terengganu police are investigating the incident.